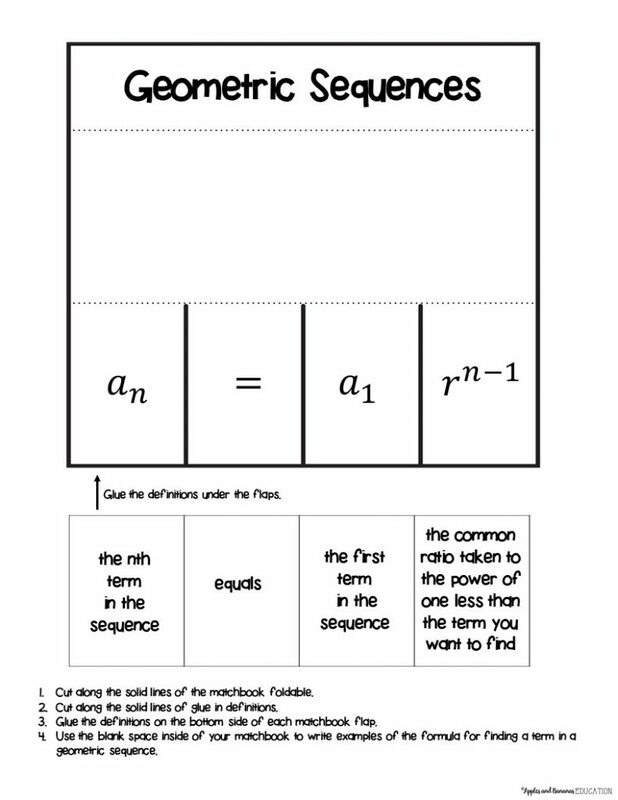 Here is a great lesson/activity for using geometric sequences to model real world problems. Feel free to use/modify this lesson plan to meet the needs of your students. Define terms related to geometric sequences. Relate the terms in geometric sequences to real-world situations. Give an example of how the formula is derived. Determine the terms in the formula given a real-world situation. » Build a function that models a relationship between two quantities. » Write arithmetic and geometric sequences both recursively and with an explicit formula, use them to model situations, and translate between the two forms. Review student understanding based on their written assessments in the “write it out” activity. 1-Student attempts to solve problem but there are errors and no justification is included. 2-Student can solve a problem but cannot justify steps taken. Make class set of copies of the handouts which can be found for free here. Prepare three visual representations of geometric sequences using dot patterns. They are included on the handout. The handouts include teacher answer keys. Have your students begin by writing the numerical terms for the visual examples given in three different geometric sequences. Next ask your students to independently write a rule for finding the next term for each of the three geometric sequences. After that, direct your students to discuss the rules that they came up with in small groups (I used groups of three). They will then adjust the rule they had written based on group discussion. At the end of the warm-up, have your students share out rules. Then, as a whole group, create a definition for geometric sequences. Review the definition of geometric sequences and discusses common ratio. 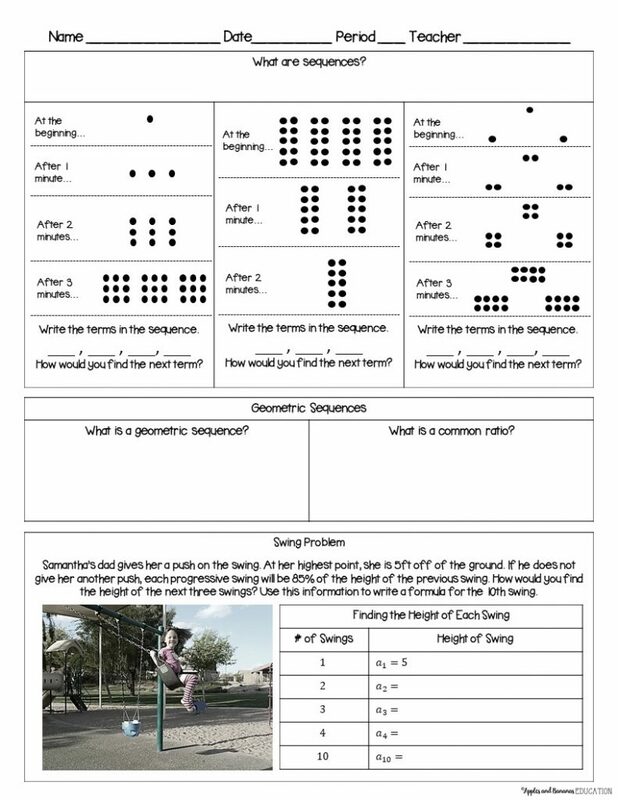 Present the “Swing Problem.” Lead your students in a discussion that helps them come up with the formula for finding the nth term in a geometric sequence by working through the real-world example. Revisit the geometric sequences from the warm-up activity. Determine the common ratio and the next term for each of those sequences. Have your students work independently to find the next terms in two geometric sequences. Circulate around the room to help support struggling students. After giving ample time for this activity, come back as a whole group and have students discuss how they found their answers. If time allows, review the formula for finding the nth term in a geometric sequence and apply the formula to two more real-world examples. Next, allow students time to review what they learned during the lesson and explain their understanding in their own words with diagrams, examples, and words. After that, have students complete the extension activity. 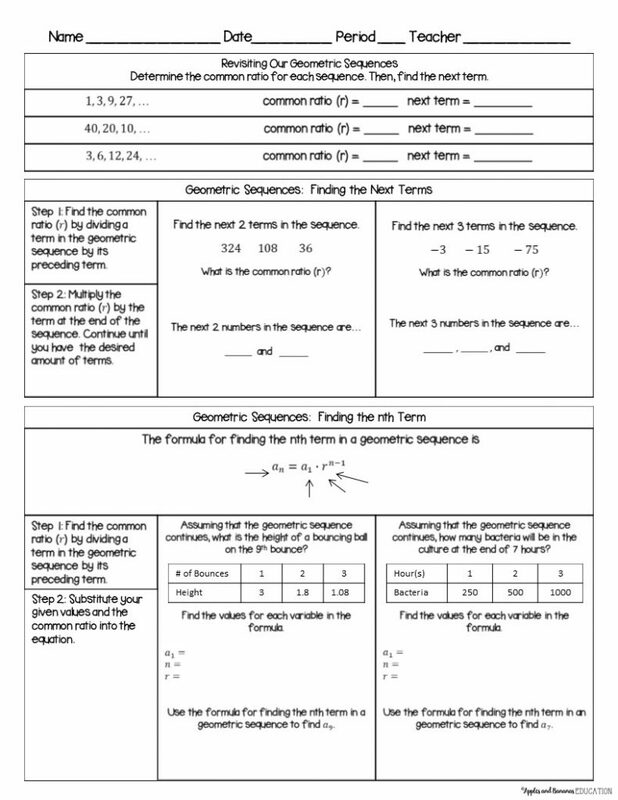 Use the foldable geometric sequence formula with the definitions for each term for review. This lesson is segmented into small, easy-to-digest pieces. Pause throughout the lesson to figure out who is ready to move on and who to focus your attention on during independent practice. Visual representations begin the lesson for ease of access to all of the learners. Visuals are especially helpful for ELLs. Everyone can determine how many dots are in each term, so this allows all learners to begin the lesson with some success (even those reluctant to participate). Real-world situation gives real-world context to refer to. Give GATE students the opportunity to extend the learning to writing equation on their own and to finding specific terms in geometric sequences. In addition, they can write two equations for the nth terms of geometric sequences and also extend the formula to find a term in a geometric sequence given a term in the sequence and the common ratio. 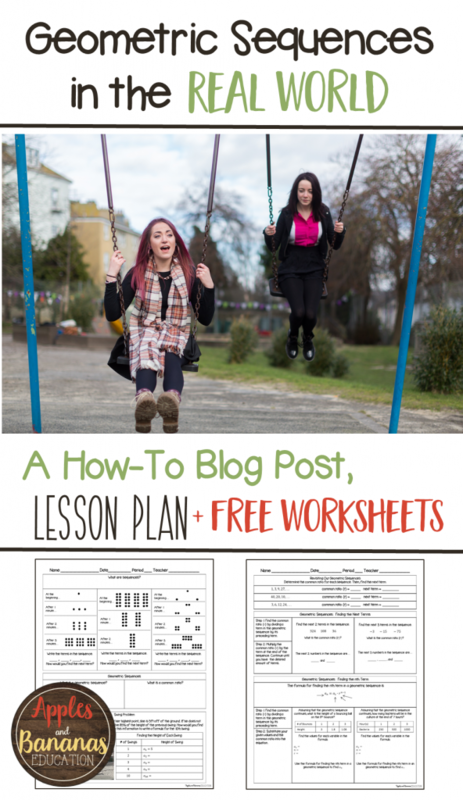 The free worksheets to accompany this lesson plan can be found through our TpT store here. If you would like your students to further explore geometric sequences, we have additional materials here.